First cup. Fourth cup - with Keurig®, it's always a fresh cup. 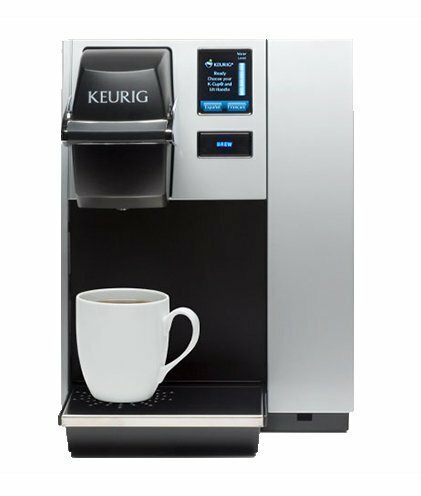 Designed for medium sized businesses, the Keurig® K150P Commercial Brewing System brews a perfect cup of coffee, tea, hot cocoa or iced beverages at the touch of a button. With a plumbed water source, it allows for back to back brews in under a minute. The Keurig® K150P Commercial Brewing System brews a perfect cup of coffee, tea or hot cocoa as well as iced beverages in under one minute at the touch of a button. It is connected to a water source to enable back to back brewing. Now everyone can brew what they love. This fully programmable brewer has an interactive touchscreen that allows you to program the brew temperature, Auto On/Off and set your language preference to English, Spanish or French. The K150P brewer has a choice of five cup sizes, offers a removable drip tray to accommodate travel mugs and a drainable internal hot water tank for transport or storage. The Keurig® K150P Commercial Brewing System is certified by the National Sanitation Foundation (NSF) for use in foodservice outlets. The K150P Brewing System is only available through a Keurig Authorized Distributor. With over 250 different varieties, Keurig® helps you offer so much more than regular and decaf. If you have any questions about this product by K, contact us by completing and submitting the form below. If you are looking for a specif part number, please include it with your message.